Economy Express is an express bus company that was established in the year 2000 and has since dominated the industry as one of the strongest players in the business. Within these 17 years of establishment, the company that is based in Kuala Lumpur has been performing their best to provide the optimum express bus service experience for people in Peninsular Malaysia. Even though the company is still considered young for some, they are surely moving in a rapid speed to stay relevant in the competitive bus industry. Having gone through much endeavors as a business, the results are finally paying off over the years and has made the Economy Express one of the most popular bus companies in Kuala Lumpur right now. Economy Express offers an approximate 100 bus routes on a daily basis that for most of the part leave from Kuala Lumpur and Selangor. The main departures of Economy Express buses are located at Terminal Bersepadu Selatan (TBS) and Hentian Duta in Kuala Lumpur, as well as Kajang in Selangor. Their buses serve destinations within the wonderful Northern Regions of Malaysia which are namely Perak (Bagan Serai, Amanjaya Bus Terminal in Ipoh and Parit Buntar), Kedah (Kulim and Baling) as well as Penang (Sungai Nibong and Butterworth). Some of the most popular bus routes offered by the company are the ones that depart from Kuala Lumpur’s TBS (Terminal Bersepadu Selatan), Kajang (Selangor) and Hentian Duta (Kuala Lumpur) going up North to Parit Buntar (Perak), Bagan Serai (Perak), Kulim (Kedah), Baling (Kedah) and Sungai Nibong (Penang). Economy Express buses provide mostly single deck buses which are equipped with either the standard 27 or 30 executive seats. Having that said, they take pride in providing you with comfort in order for you to have a pleasant journey accompanied by a good book in hand. Rest assured that the coaches of Economy Express buses are fully air-conditioned for your travelling needs. In addition to that, the spaciousness in the bus coaches promise to ensure every passenger with a satisfactory environment especially during the long-distance journeys because nothing says unbearable more than a tight space. Without a doubt, Economy Express’ considerations as a bus operator for their patrons must be commended because they will diligently make sure the customers’ experience of taking buses with trust and safety is their number one priority. Having that said, in order to guarantee you the high-quality service that the company has been offering, Economy Express provides bus services that comes along with experienced and well-trained work forces to ensure passengers are trusted in the safest hands during each travel. Loyalty plays a large part in Economy Express services in order to retain their existing large customer base that is ever-growing, so it’s good to know that the bus company put the patrons first because they know that without them, the company wouldn’t be where they are today. Entertainment is provided on each coach in the form of televisions especially for the restless folks who are not able to fall asleep during their trips or just an easy outlet to give your child some distractions onboard. Economy Express rides also present you with possibly one of the best things in the world on their coaches – charging ports. In this technology-driven world that we are living in today, it is almost crucial that electrical devices like your cameras or smartphones are always on the run, so it constantly needs to be charged fully in order to capture wonderful moments upon arriving at your destination, so these charging ports are a lifesaver for a lot of us. If you are not a fan of what is shown on the television, then whip out your tablet and watch your preferred show without having to worry of your battery running out. Even if you have never been there before, why not make it a new plan to explore the Northern Region if you haven’t when Economy Express buses can easily take you there and make sure you arrive safely? There are plenty of exciting things to do at the mentioned routes they are headed to. Whether you want to take a hike at the scenic Sungai Sedim Recreational Forest in Kulim in Kedah or just to go hunting for delicious food at Parit Buntar in Perak, trust Economy Express to be all set to take you there to start your adventures in order to help you build new memories to keep. What are you waiting for? Make a trip up to the Northern Region of Peninsular Malaysia now with Economy Express buses that recognizes the balance in excellent service, price and quality to have a memorable and enjoyable bus trip. Get on in the action to witness it for yourself. 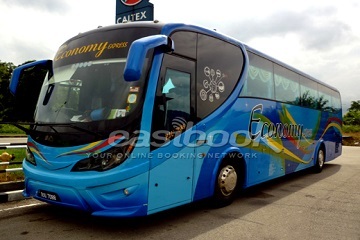 Book an Economy Express bus ticket at Easybook.com right now, recline back and enjoy the ride!